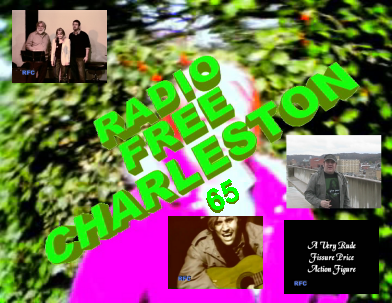 Radio Free Charleston 65, “Give Peace A Chance Shirt,” is online now! This episode showcases two songs performed by Bare Bones, an acapella group consisting of Bill Kimmons, Becky Kimmons, and Mark Davis. We also present the short film “FOOTLUCY”, starring the late Joe McComas. Plus, there’s animation by Wallace Padillo. Host segments were shot late Monday afternoon at an undisclosed location near downtown Charleston. It was very windy, but we managed to do something unusual with our host segments this time. This is the first time that the host segments were entirely ad-libbed, recorded in one take, shot in the correct order, and required no post production or editing. It only took us sixty-five episodes to achieve professionalism. Or as close to it as we’re going to get with no money changing hands. Bill Kimmons and Becky Kimmons used to be part of the acapella group Soup Kitchen, with Will Fanning. Will is spending most of his time running the Brazen Head Inn in Pocahontas County, while Bill and Becky have recruited Mark Davis (The VooDoo Katz, Crazy Jane) and reorganized themselves as Bare Bones. A few weeks ago, Bare Bones took the stage at LiveMix Studio to re-record some of their Soup Kitchen material with Mark for a new CD release. We were lucky enough to be asked to bring our cameras to record a few songs. On this episode of Radio Free Charleston, you will hear Becky Kimmons’ original song, “I’d Rather Be Your Number Three” and the traditional tune, “Prodigal Son,” both of course featuring their tight acapella harmonies. 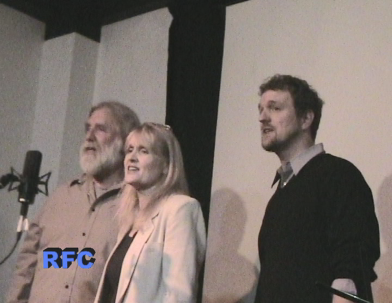 In a set of credits accidentally omitted from this episode, we forgot to mention that the Bare Bones performances feature camera work by the lovely Melanie Larch, the gorgeous Brian Young, and the not-too-repulsive Rudy Panucci. The Bare Bones songs are directed by Brian Young and Rudy Panucci and edited by Rudy. 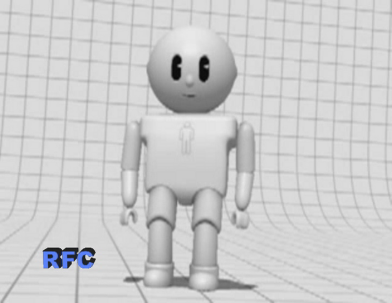 The animation this time, featuring a very rude action figure indeed, is by Wallace Padillo. You can expect a full, detailed biography of Wallace the next time we run one of his cartoons. On a somber note, and the reason that we sort of break format with this episode of Radio Free Charleston, we recently lost Joe McComas, who passed away at an all-too early age in March. Joe was loved by many friends in the Charleston music and film community and we decided to pay tribute by presenting the film “FOOTLUCY.” which was directed by Brian Young, based on a story by George Gloucester, in 1993. Joe’s voice is the only one you’ll hear in this film, and you can tell that he was a hell of an actor. I was the assistant director on this film. Most of my duties involved holding the reflector so we could get enough light on Joe’s face, as he sat in the doorway of the Empty Glass. I can also be seen as the guy walking into the alley. I also ran camera on one shot, because Brian was in it as the angry motorist. Jon Steele shows up as Bottle Bill, and Kristi Matthews is Footlucy. While there’s nothing explicit in this film, it is a little darker and edgier than our usual Radio Free Charleston fare, but we felt the world deserved another look at Joe’s talent. 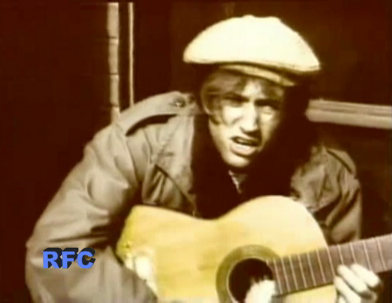 That’s it for this episode of Radio Free Charleston. If anyone knows the current whereabouts of George Gloucester, please give us a heads up in the comments section. Brian has lost touch with him over the years. Radio Free Charleston will return in one week, with Electro Biscuit and the exciting debut of a dynamic new talent, Bradley Wilkerson. I almost saw that little toy guy’s junk when he was dancing. The youth of today have no shame. I have been trying to view “Footlucy” and am unable to do so. I would love to see this film as I knew Joe McComas from years back. If you can e-mail the film so I can download it, I would rally appreciate it. I have been tryiing to access it via Mutimedia on The Gazz and it is not coming up.